Yes, the holiday is finally over and everyone is positively hopeful and excited with what 2015 has to offer. New Year is the perfect time to start anew, to venture into new challenges, to break the monotonous routine in the past and creating memories by enduring yet another direction, conquering roads that you haven’t tried before. It is so much fun to start with a clean slate. Fashion for an instance is an ever changing and yet exciting revolutionary aspect of human need that never, ever stay put. There is no parking space allotted for fashion-it is, as a matter of fact” always on the go”. This season, you can expect the hottest trends – from couture to runway, street styles and ready-to-wear outfit both for men and women. So brace yourself up as we get to know more on what’s in, this 2015! Here comes spring! If maxi dresses, floral miniskirts and those cute shorts are what you are thinking, then you are selling yourself short. According to Nikki Ogunnaike, of glamour.com, Spring 2015 gets even more exciting as it offers stylish twists. Here are the highlights of the forecasted trends from runway to wearable fashion that can be worn from work to dinners and parties at night. 1. Shirtdresses. This classic must-have has been re-imaged not to look so preppy, boring and safe. This 2015, tug the waist with a trendy belt to create an illusion of trimmer tummy and let the slit give a glimpse of either a colorful short, or a cute dress. A pair of killer heels will definitely complete the look. 2. Culottes. Apparently, 2014 is not yet over as fashionable culottes has been a carried-over trend this 2015.What’s so great about this flared culottes is the fact that you can wear it with coats and blazers or with tank tops and fitted shirts and look absolutely fabulous. 3. The Kimono Loco. Who says that kimono is just a traditional Japanese garment? In the first place, Wikipedia defines kimono literally as “ a thing to wear”. (Ki means “ wear” and mono “thing”). So the fashion industry embraces the beauty of kimonos and offers a wide array of style: from kimono-style cardigans, jackets, drapes and sheaths with contemporary floral designs to plain colors which looks great to women of all ages. 4. Soft, cool hues, nature’s neutral colors, ethereal. Pantone (a renowned company that has a global authority on professional color standards for the design industries) announces that this is a year where we will see more of soft palettes of cool and earthly hues both for men and women (beige, browns, and neutral colors of aquamarine, cool blue and soft, serene greens) with subtle warm tones (orange and mandarins, yellows and military greens). According to them, it is the perfect time to disconnect from technology and go back into that dreamy state of unwinding and be still, taking cue from nature. 5. Baggy Cuts and Roomy Denims are back. Jeans, for instance has always been a fashion item because of its style and comfort. But what makes it cooler this year is the anticipated return of baggy pants and roomy denims. So, it is the perfect opportunity to rummage your heap and bring back all of your big, baggy jeans and style it with cropped and slim-fitted shirts and tops for contrast. 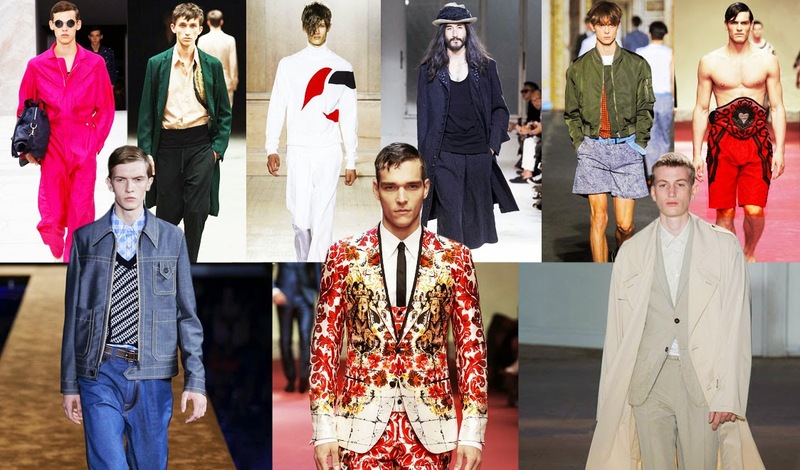 Aside from the colors stated on the above as forecasted by Pantone, fashion wear for men this year is highly anticipated due to a remarkable evolution of trends and style as men are starting to be more aware of what they will wear and how to be stylish yet manly. Yep, stylish gents are in. We have seen a tremendous change with menswear and that fashion industry that directly targets our hombres has never been this busier. 1. Jackets and coats with silhouettes. Well, coats and jackets has been the staples of men but get ready with jackets and coats with silhouettes that creates an adverse illusion of slimmer and narrower waist and emphasizes those masculine shoulders. Cropped jackets had been sighted, along with leathers, velvets and that 60’s urban styles of suits (plus the slim ties) for the ardent guys. 2. Splashes of colors. Bored of the usual black, white and grays? This 2015 offers vibrant colors to spice up the getup. From neon colors in the running shoes, to flirty colors emblazoned in the coats and colorful skinny pants and tees. Who says men can’t be fun in their getup this year? 3. Shorts. You have seen those bold, straight guys who braved out the society’s scrutiny by wearing shorts and cropped pants. As a matter of fact, a lot of men’s magazines push this cool new trend of tailored jackets with shorts and loafers plus duffel bags. Tres elegantes. 4. Tanks and plunging tops. Sleeveless and tank tops in contemporary look to funky designs are now in. Greatly worn underneath a tailored jacket for a business casual look. Plunging tops? Why not? 5. Loafers and man bags. For those busy men who are so dedicated to work, you still can look so fashionable yet articulate and respectable and that can be through your shoes. The classic Loafer has now been reintroduced, making it the most elegant shoe trend. And instead of the usual attaché case and sling mailbags, this 2015, get ready with more colorful and creative man bags. From tote, to handbags and slings, man bags will definitely be kicking off. 2015 is definitely a great year for wardrobe makeover and more creative ways of styling. But the greatest key to rock them as they say… is definitely to own it. Fashion is an expression or a statement of your own individuality. So be you, try to experiment. Have fun and be spontaneous!